We arrived in Prague’s low-ceilinged Hlavní Nadraží Train Station at midnight—an unplanned (very) late arrival due to ongoing train troubles and weather woes. After our “questionably legal” taxi ride to our hotel, we were ready for a good night’s rest. Since we only had 1.5 days in Prague, we had to plan our time wisely. Our first stop was The New Town to experience the more modern, urban side of Prague. We started at the top of the Wenceslas Square (more like a boulevard) by the National Museum and the statue St. Wenceslas and walked past the many retail stores, cafes and restaurants until we found ourselves at yet another Christmas Market (despite being two days after Christmas). There we tried trdlo (a warm, lightly sweetened cinnamon bread wrapped around a cylinder-type thing) just because it looked interesting. Quite tasty. From Wenceslas Square, we walked to Old Town Square (with another bustling Christmas Market) and marveled at the incredible architecture. 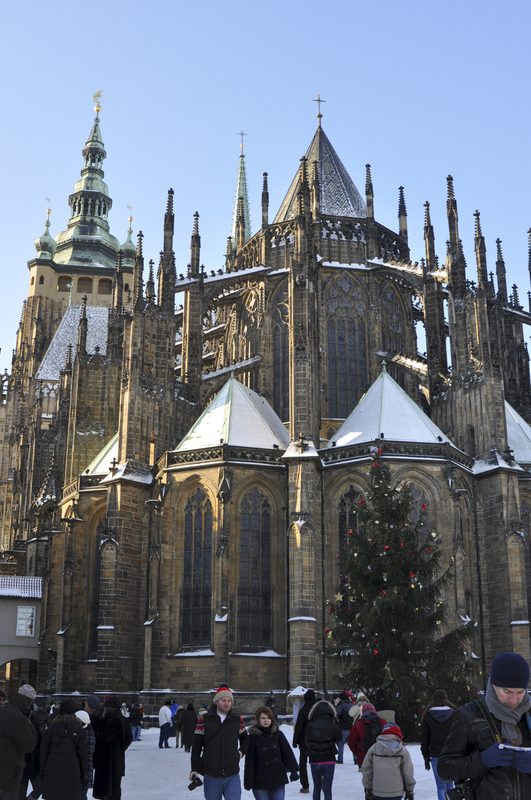 Most notably, the Church of St. Nicholas, the Gothic Týn Church and the Old Town Hall clock tower. At the base of the clock tower is Prague’s famous astronomical clock. Its moving dials, disks and celestial symbols keep time several different ways. It is a marvelous instrument. We did our best to try to figure out how it actually works. We admired the snow-covered Jan Hus Memorial in the square’s center and then made our way to the Jewish Quarter. We toured the Pinkas Synagogue, dedicated to the victims of the Holocaust, where the handwritten names of over 77,000 Czech Jews cover the walls. From this moving memorial, we entered the Old Jewish Cemetery. Tombs, dated 1439 to 1787, are buried several layers deep. The crooked tombstones and uneven earth create a very memorable scene. At night, Kevin and I went to a classical music concert at the Church of St. Nicholas in Old Town Square. The music was enjoyable, but the freezing temp in the church was not. We huddled together to stop the shivering. The next morning we took the tram to Prague Castle. This massive castle complex is the seat of Czech’s government and boasts some of the best views of city. We visited St. Vitus Cathedral to see Czech artist Alfons Mucha’s grand stained-glass window. We also walked around the Castle Square to admire the various architectural styles along with the dramatic views of the city below. After our castle visit we walked across the famous Charles Bridge, one of Prague’s major landmarks. Thirty statues of various saints follow you, one after the other, as you cross the bridge—each one with its own story. Prague is a beautiful city with some of the most amazing architecture. K and I enjoyed ourselves and hope to return in warmer weather.